This Friday is extra happy because I'm actually doing something other than sitting at home and watching TV! I have plans! 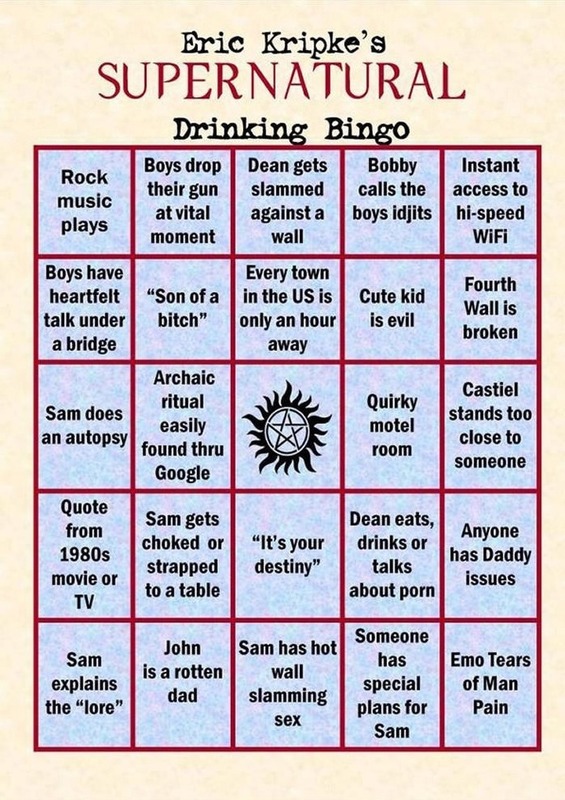 Of course, those plans are to go over to a friends house and watch many episodes of Supernatural so we can play the Supernatural drinking game (courtesy of tumblr). Or just drink a lot while watching the show... I'm guessing this will be more likely. I think there are some kind of "rules" to follow but knowing me, I'll get so caught up in the show that I'll stop paying attention to them and I'll just drink a lot anyway. But I won't be on my couch so technically it's still getting out of the house. Progress! If you wanted to play it's easy... Google! Plus with the interwebs I'm guessing there is a drinking game for any show or movie you could possibly want. And on the off chance there's not, just make it up as you go. After Supernatural I'm expecting a lot of Ghost Adventures and Doctor Who. After watching Sharknado last night I can't wait until someone figures out a drinking game for that. Because I am too lazy to come up with something myself. Have a great weekend!